For a group of women from the Makgolokweng area in QwaQwa, the shortage of employment opportunities in the area has not prevented them from putting bread on the table for their families. They rolled up their sleeves and started baking their daily bread. Job opportunities in the rural areas of the eastern Free State are very scarce. Most people have farming-related jobs. The few manufacturing companies in the area are in the textile industry, but even in this sector, many people have lost their jobs in recent years. For a group of women, the famous Chinese saying "Give a man a fish and he'll eat for a day, teach a man to fish and he'll eat for a lifetime" has rung true as they decided to make a plan to put food on the table for their families. 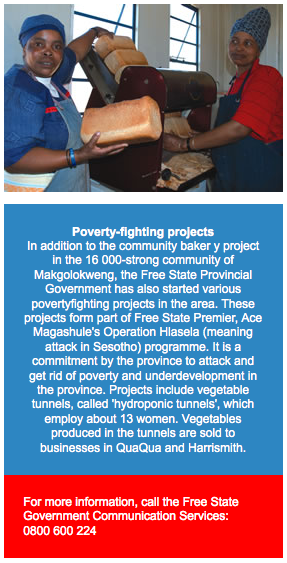 About four years ago, the group of 15 women and some men formed a co-operative called Kholokoe Community Bakery. "In the beginning, we had teething problems like any new business, but we soon overcame them," says Kholokoe Community Bakery spokesperson, Ida Msimang. Msimang explains that the community bakery started from a small customer base, but expanded during the last four years. In the beginning they were supplying schools with bread as part of government's National Primary School Nutrition Programme, known as the School Feeding Scheme. They now supply bread and buns to schools in the Thabo Mofutsanyana District Municipality, which includes the towns of Fouriesburg, Clarens, Harrismith, Kestell and Bethlehem. Using one baking machine and two ovens, they bake 600 brown loaves every day. Their customers also include a local prison and a hospital. Msimang said because of the limited baking equipment, they have not been able to meet the demand for their products. In the meantime, they have approached the National Development Agency (NDA) and asked for extra funding to buy another baking machine. "At least, we are now able to support our families thanks to this bakery. We start work at six o'clock in the morning and work until late in the evening," she said. Some of the men are responsible for delivering the bread to their customers, while the others provide security at the bakery premises.